Haole, gather round and hear the history of Hawai’i that you may not have learned in school. This story is not pleasant and may be hard for you to hear, since it was our ancestors who caused these atrocities. It all started with Captain James Cook who “discovered” the islands and introduced foreign systems and values that includes, but is not limited to, capitalism, western politics, predatory individualism, and Christianity. 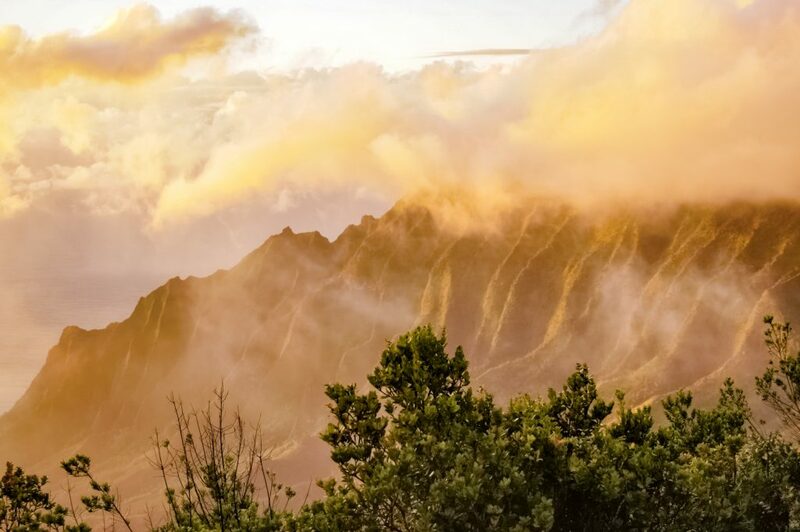 Although many of these concepts are celebrated in western culture, many undermine the Aloha spirit of endless sharing and altruism to the land and its people. But, like in almost all native history, the most devastating thing that was brought by colonizers was disease. Disease was estimated to reduce the native population from one million, at contact, to less than 40,000 by 1890 [i]. This calamity allowed for the British, French, and Americans to gain control of the land and enter the Sandalwood trade and whaling activities in the nineteenth century. At this same time, missionaries entered and gained religious control, and pushed out Hawaiian culture and religion. Before 1843, land was communal, and people only took what they needed from the land. The sharing and caring of land is a fundamental value in Hawaiian culture; land and nature are never objectified or seen as a commodity. Instead it is personified, something that everyone must respect and value go out of their way to celebrate and care for. Land in ‘Ōlelo Hawai’I stands for that which feeds us, not how much money can I make off it. This interpretation of land directly contradicts capitalism. The privatization of land was one of the biggest factors of the annexation of Hawai’i. After 1843, during the times of Manifest Destiny and aggressive implementation of the Tyler Doctrine, King Kamehameha was pressured into dividing and privatizing the land. Haole men who created massive sugar plantations wanted private land, so they could boost their reign of power in the region. After the acquirement of land, the sugar plantation owners pushed for annexation so that they could avoid sugar tariffs. By the 1880s the United States simultaneously felt the pressure of the rich sugar planters and recognized the military importance of Hawai’i; this led to the cession of Pearl River Lagoon in 1887 for duty-free sugar, and the “Bayonet Constitution. They Bayonet Constitution made it so that the Hawaiian ministry would no longer be responsible to the king, but to the legislature. To ensure that the legislature consisted only of white people the electorate was restricted to those who had around $600 to $3,000 worth of property. By 1888, three-quarters of all arable land was controlled by haole men. In 1893, white men held all the political and economic power, which led to the unlawful overthrow of Queen Lili’uokalani, the sole sovereign of Hawai’i at the time. Queen Lili’uokalani abhorred violence, and sought to avoid it at all costs, so she temporarily succeeded. Upon her succession she stated. “Now to avoid any collusion of armed forces and perhaps the loss of life, I do under this protest and impelled by said force, yield my authority until such time at the Government of the United States shall, upon the facts being presented to it, undo the action of its representatives and reinstate me in the authority which I claim as the constitutional sovereign of the Hawaiian Islands” [ii]. Soon after the succession President Cleveland sought to understand the succession, so he sent Commissioner James Blount to investigate what happened. Blount reported that the U.S. was guilty of an illegal overthrow and landing of the marines, and there is a clear conspiracy between the current minister of Hawai’i and the plantation leaders. To which President Cleveland responded with, “By an act of war, committed with the participation of a diplomatic representative of the United States and without authority of Congress, the Government of a feeble but friendly and confiding people has been overthrown. A substantial wrong has thus been done with due regard for our national character as well as the rights of the injured people requires we should endeavor to repair” [iii]. Unfortunately, President Cleveland’s term soon ended and final annexation happened under President McKinley in 1898. There was no vote in Hawai’i for annexation, or in Congress. Most of Congress opposed annexation due to Hawai’i being made up of mostly minority people, but many wealthy men saw the economic benefits of turning it into a state. So, it was annexed through resolution rather than through treaty. 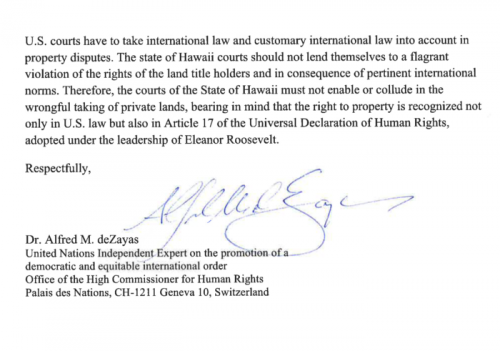 The process by which Hawai’i was created a state is illegal, and directly defies Article 17 of the Universal Declaration of Human Rights. 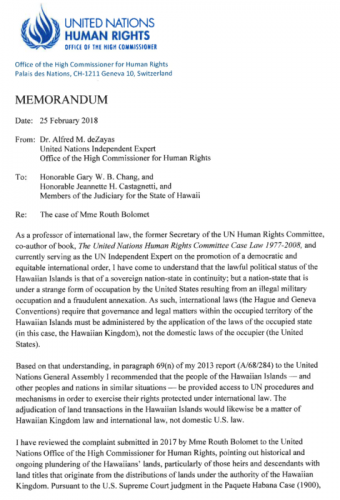 I have attached a memo sent on February 25, 2018 to the members of the Judiciary for the State of Hawaii. This memo offers aid to the Kingdom of Hawai’i if they desire to seek sovereignty [iv]. Now that you understand a snippet of history of Hawai’i it is important to note that colonization still affects everyday life on Hawai’i. It has just manifested in new forms like tourism, real estate, and industrial agriculture. Activist, politician, scientist, and teacher, Haunani-Kay Trask, sums up the how tourism is a new form of colonization in her essay “Lovely Hula Hands”. This essay focuses on how the evolution of how corporate tourism in Hawai’i has led to “cultural prostitution” and disconnection from the land. “Of course, many Hawaiians do not see tourism as part of their colonization. Thus, tourism is viewed as providing jobs, not as a form of cultural prostitution. Even those who have some glimmer of critical consciousness don’t generally agree that the tourist industry prostitutes Hawaiian culture. To me, this is a measure of the depth of our mental oppression: we can’t understand our own cultural degradation because we are living it. As colonized people. We are colonized to the extent that we are unaware of our oppression. When awareness begins, then so too does de-colonization” [v]. Haole, doesn’t it make sense now? When you hear tourists coming back from vacations complain about the kama ‘aina being rude do you see why their actions are not unfounded? When you travel to Hawai’i, or any place that has been colonized, it is of the upmost importance that you are conscious of the indigenous people who inhabited or are inhabiting the land, be respectful of traditions and the land you are on, be supportive of their activism and political efforts, and most importantly listen to them talk about their story. [ii] VON HOLST, H. E. “The Annexation of Hawaii.” The Advocate of Peace (1894-1920) 60, no. 3 (1898): 63-70. http://www.jstor.org/stable/25751152. [iii] Digital History, ” Grover Cleveland on the Overthrow of Hawaii’s Royal Government (1893),” Digital History. [iv]1. deZayas AM. The Case of Mme Routh Bolomet. In: Expert UNI, editor: Office of the High Comissioner for Human Rights; Feburary 25, 2018. [v] Trask H.K., “Lovely Hula Hands: Corporate Tourism and the Prostitution of Hawaiian Culture.,” Contours 5 (1991).